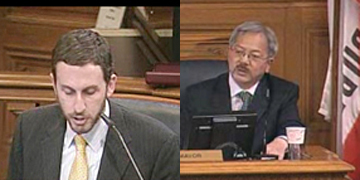 SF Taxi Media: Supervisor Scott Weiner Asks Mayor For Large Increase In Taxis. And... MTA Not Ready To Vote Just Yet Whether To Expand Medallions Sales Pilot Program. By John Han. Supervisor Scott Weiner Asks Mayor For Large Increase In Taxis. And... MTA Not Ready To Vote Just Yet Whether To Expand Medallions Sales Pilot Program. By John Han. San Francisco interim Mayor Ed Lee answered questions Tuesday regarding public policy, during the Board of Supervisors meeting in which once every month, there is a Q & A session with the mayor. With respects to taxis, Supervisor Scott Weiner asked the mayor whether he would look into the amount of taxi service already in San Francisco, and whether or not he would support a "significant increase" in issuing new medallions. The supervisor said that even with the 87 medallions already approved to be issued in the near future, the numbers would still be inadequate. The mayor responded saying that a "Public Convenience And Necessity" study would determine the adequate amount of medallions needed to accommodate San Francisco's "growing population". Mayor Lee says that the City expects to award a contract with a consulting firm by January 1, 2012, and that that firm would hold stakeholder interviews and "industry best practices" studies. According to a poll by the Bay Citizen, Ed Lee is on pace to win the mayoral race by a landslide margin and become the City's next mayor. Although, some doubt the poll. Click here for more on that. Here is the quick transcript of Mayor Ed Lee's response to Supervisor Weiner. Supervisor Weiner: We will never truly get people out of their cars without reliable taxi service but this has been over a decade since we significantly improved service. The current levels are inadequate and unacceptable. There will be approximately 85 new permits. Understanding the California environmental quality act—analysis may be required to have a larger increase in the number of taxis. How will you make certain that you look into the amount of taxi service? Will you support a significant increase in the number of taxi permits. Mayor: Thank you for your sustained attention to the issues of the taxi industry. The taxi system is a critical part of the transit network and a key component to the transportation policy. Having a robust taxi system allows people to travel around without having to hold a car. Our taxi fleet is a key partner in reducing citywide carbon emissions. In the past three years, this has resulted in 35,000 tons of greenhouse gas emissions savings, the equivalent of taking 400 passenger cars off the road. It is clear that the taxi system has room for improvement. And I have spoken to people who have a hard time getting a taxi when they need one, including senior citizens and those requiring accessible vehicles. We have to improve service in a way that works for riders and taxi drivers. This public convenience and necessity study—it will determine the number of taxis required for an adequate level of service to the growing population of San Francisco. We will have stakeholder interviews and the industry best practices, recommending changes in how we calculate the meter rates, and the contract is expected to be approved and awarded by January 1, 2012, completed by the end of next year. Once this is completed, the level of environmental clearance can then be determined. And the mass transit authority will make certain of the adequate funding—and I know you [will] continue to watch this issue and I am happy to let you know I will be held at any time on this issue. MTA Board Meeting, October 18, 2011 - Whether to vote at its next November 1st, 2011 meeting to expand the Medallions Sales Pilot Program. Earlier that morning during the MTA Board meeting, director Bruce Oka recommended that the Board of Directors add to the agency's next meeting's agenda item, a vote to continue and expand the Medallion Sales Pilot Program. That meeting would be November 1, 2011. Oka said that expanding the sale of the City's taxi medallions would allow more people to buy and sell the coveted medallions. "It's money in our coffers, " said Oka. "And, it gives the drivers some income and a way out if they want to leave the business." Secretary of the Board Roberta Boomer said that it would not be likely that the Board could vote on that item at its next meeting. "There are several things that have to happen at a subsequent meeting", Boomer said. Director Malcolm Heinicke said it is a, "timing issue". He cited the May 17th Board meeting in which the Directors requested a full report from the Taxi Advisory Council (TAC) on observations and recommendations for medallion sales, and that the Board is waiting for the report to be finished. The MTA's administrative process of matching medallion sellers with buyers, and approving loans may have been slower than first anticipated. But Heinicke noted assurance from Deputy Director Christiane Hayashi that the full report regarding medallion sales is still, "in the works". Heinicke said he agrees with Director Oka about the importance of the medallions sales process. "I'm fine with following up and sort of making sure that we're moving this along", Heinicke said. "Because there's a lot of our other planning that is dependent on how we go with that particular project. But I certainly wouldn't want to force it to the next agenda if it's not ready for that then." MTA Board President Ed Reiskin said that the TAC is still weighing in other alternatives to the Medallions Sales Pilot Program, and that he is hoping the council will submit a consensus recommendation soon. "What I did discuss with the Vice Chair of the TAC is potentially bringing back an interim solution sooner to extend the pilot, since I think many people share Director Oka's concern about the speed at which with this is moving", Reiskin said. "We will have something to report back sooner rather than later," he said. During public comment, four proponents of expanding medallion sales, including three members of the TAC, urged the Board to expedite the process. TAC members Dan Hinds, president of National Cab, Carl Macmurdo, president of the Medallion Holders Association, and Timothy Lapp of Yellow Cab spoke in favor of expanding the sale of medallions. Charles Rathbone of Luxor Cab also gave public comment in favor of expanding the program. Barry Taranto and Tariq Mehmood also gave public comment opposing the MTA's policy on 5% credit card fees being passed on from cab companies to taxi drivers. Hope everybody is ready for 500 more cabs, so ye all may as well enjoy that little bone they threw us a few weeks ago cause it aint gonna last, Ed Lee has bin groomed and polished by his majasty Willie Brown to be the next Mayor and the first thing he's gonna do is deregulate the whole system. Ive bin talking about this for ages, My source tells me that his williness is pocketing two million for this deal going down. So we may as well stick our heads between our legs and kiss our rear ends good bye cause the whole fleet is sinking. Everyone only thinks 500 more cabs, I heard through the grapevine that it may be as many as 1000 more cabs. A pretty reliable source at that. I think cabbies should stick together and not be split by so many organizations and groups. Oh and not to forget those who try to help, stop attacking them! directly and may be publicly. things to keep the industry aware and appreciate the truthness of your blogs compare to another bloger who just lie several things what suits to that person.